Legal Sea Foods is perhaps the one dining chain most associated with Boston. Although they position themselves as "a seafood company that happens to be in the restaurant business", I think they're sandbagging when they say this. They're extremely thoughtful about the marketing of their restaurants, and as a consumer I think this is a good thing. A while back, I heard from Legal Sea Foods' PR firm that they were running a special "Monday Wine Madness" special. For less than $10 a glass, they'd be offering a rotating selection of premium red and white wines that would ordinarily be much more expensive. Although this sounds like an interesting offer, I haven't had a chance to stop by on a Monday night. However, I did get a chance to stop in for lunch at their Chestnut Hill, MA location recently and found their wine offerings very much to my liking. 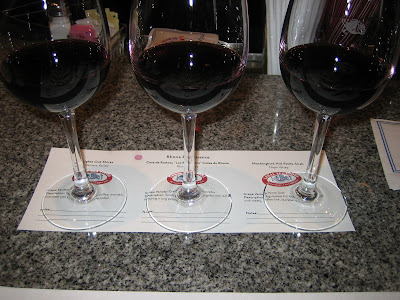 I thought it was a bit peculiar that a tasting flight of Rhône varietals included Australian Shiraz and Napa Petite Sirah (Syrah and Shiraz wines are made from the same grape, just different spelling for different places). I guess the idea was to experiment with various takes on the Syrah grape which is the traditional grape of the Northern Rhône region of France. But the presence of Petite Sirah threw me because I've heard that Petite Sirah is a distinct variety not-so-related to Syrah (read this Wikipedia entry if you want to be further confused). Somewhat surprisingly, my least favorite of the three was the Australian Shiraz. I say this because I find Australian Shiraz to be an abundant source of affordable and flavorful wine, and at this price point I thought it would be easy to find a tasty one. 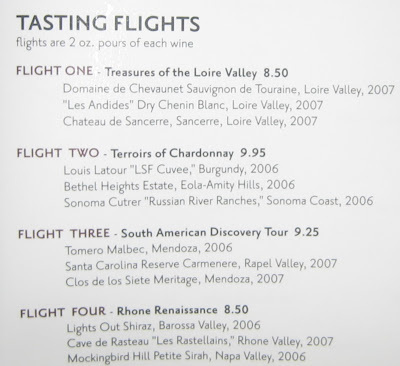 However, for me the flight's strength was the Côtes du Rhône and the Petite Sirah. In my experience, Côtes du Rhône is a wine I'd recommend for exploration as a source of French value. French wine may have a reputation for being expensive and fancy, but Côtes du Rhône bucks that trend. It's not too hard to find a $10 bottle of that's fantastic. I'd rate this 2007 Cave de Rasteau Côtes du Rhône Les Rastellains 86 points. Another I'd recommend for your consideration is the 2006 Domaine Paul Autard - also less than $10 and also one I'd rate 86 points. The Mockingbird Hill Petite Sirah was the star of the flight. What a fantastic wine! This was a big California red wine, and it's tough to find a nice bottle in this category south of $20. At $15 by the bottle, it is one I'd recommend you seek out for sure. I'd rate it 90 points. How many times have you enjoyed a wine at a restaurant, noted the producer and thought to buy some if you ever saw it in a store? I've tried this many times, and I've hardly ever come across the wines in a retail setting. The best part about Legal Sea Foods' wine program (at their Chestnut Hill, MA location anyway) is that you can pick up a bottle or even a case of your favorite wine in their to-go market on your way out at *very* reasonable prices. You might be interesting in an upcoming series of wine cellar sessions at Legal Sea Food's Park Square Boston Location. Question of the Day: What do you think of Legal Sea Foods? What do you think of their wine program?